Ever find yourself with a broken car on the side of the road in need of a simple tool or a set of jumper cables? 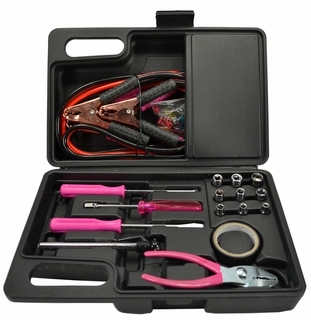 You can easily avoid that nightmare with this 35 piece emergency roadside pink handle tool kit! • 1x Cloth Work Gloves. All of these items come in a convenient and sturdy plastic case perfect for staying organized and being ready for your next unplanned auto adventure.